A Dundee garden centre and farm shop is closed today after Storm Ali damaged a 153-year-old conservatory. Video footage shows shows folk struggling to cope with Storm Ali close to V&A Dundee. Local residents have been warned that their road could be closed for the rest of the day after strong wind brought down trees. The V&A Dundee has closed its doors to visitors this afternoon due to Storm Ali. Trains from Dundee Railway station are at a near standstill, with services knocked out between Dundee, Edinburgh, Fife and Perth thsi afternoon. High winds have caused restrictions on Tay Road Bridge this afternoon. 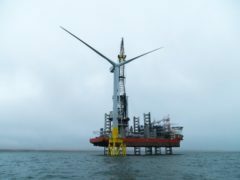 The world’s most powerful wind turbine has been successfully installed in waters off the coast of Aberdeen, developers said. Police have issued a weather warning for high winds across Tayside. The temperature in Dundee is set to feel like -6C this weekend with a cold snap on the way. A weather warning for the impending arrival of Storm Eleanor has been placed on Dundee. A map showing the potential impact of Storm Caroline states that the Dundee coastline could be flooded by a high tide. The Met Office has issued a wind alert for Dundee, with gusts of 60-70mph expected "quite widely". The Met Office has issued a yellow alert for strong wind on Monday. A man has died after a tree fell on his car during the prolonged spell of rain and wind that has plagued Tayside in the past 24 hours. Motorists have been urged to use caution on the Tay Road Bridge due to high winds affecting driving conditions. Tayside has been battered by snow and strong winds overnight. Follow our live blog for the latest weather updates. You can send us your photos and updates to newsdesk@eveningtelegraph.co.uk, on our Facebook page or on Twitter pages using the hashtag #teleweather. The Forth Road Bridge will remain closed during the evening rush-hour as work continues to recover a lorry blown over in strong winds.